Have an account? Login here. Don't have an account? Click here to register. Early-mid, tall open plumes, lavender flowers. Astilbe produce large plumes in various sizes and shapes. Each plume consists of hundreds of tiny flowers, each opening in succession, providing a long season of bloom. Plumes make excellent fresh cuts or for drying in natural bouquets. Astilbe grow best in moist soils and semi-shade. Will tolerate more sun with adequate moisture. Excellent for the woodland garden. Plant in mass for a stunning display. Plant: Plant eyes 1/2" below soil surface and spread fibrous roots throughout soil to facilitate quicker growth. Gently pack soil to reduce air pockets and soil settling. Grow: Grow cool, 55 - 60F, for best growth. In early spring, and with adequate moisture, Astilbe can be grown in full sun. For late spring and early summer crops when light intensities are high and when temperatures exceed 65 - 70F, it is best to grow Astilbe under 30% shade. Water: Water immediately and keep Astilbe moist at all times. As shoots and foliage appear, increase water frequency. If pots dry out, the foliage will crinkle and turn brown. Arendsii Astilbe: This group comprises some of the oldest and original hybridized varieties, yet they remain some of the more popular in production. Generally taller varieties and early blooming, which make them well-suited for larger container production. Chinensis Astilbe: This group is often the last Astilbe to bloom. 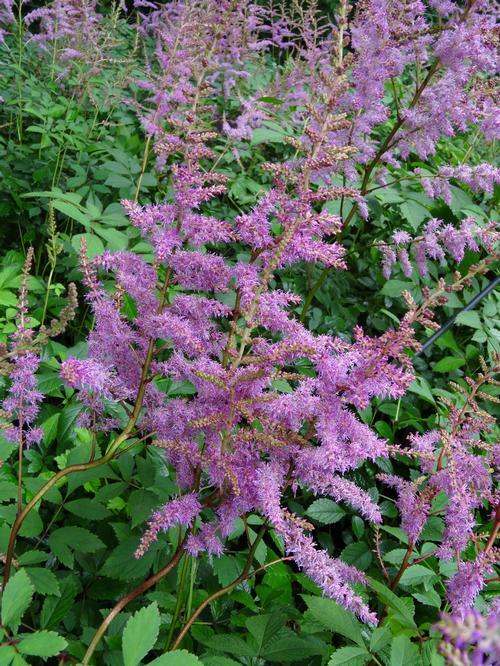 Plants are generally more hear and drought tolerant, lending themselves to areas where other Astilbe fair poorly. Foliage is mostly coarsely textured and stems are thick and sturdy. Heights are varied from the shortest to the tallest but flower plumes are mostly narrow and upright. Japonica: This group generally blooms early and plants are a bit more compact. Foliage is mostly glossy green with pyramidal-shaped flower plumes. Excellent for pot plant production. Simplicifolia: Slower growing and more compact with glossy foliage. Generally bloom late season with delicate, open panicles. These types will often rebloom. © 2019 Growing Colors. All Rights Reserved. Site Produced by Clarity Connect, Inc.